I know I have seen a lot of threads on riveting the trailing edge and thought I would share how I decided to rivet the rudder trailing edge which turned out with zero twist (as far as I can measure with a digital level) and very little pillowing. 1. 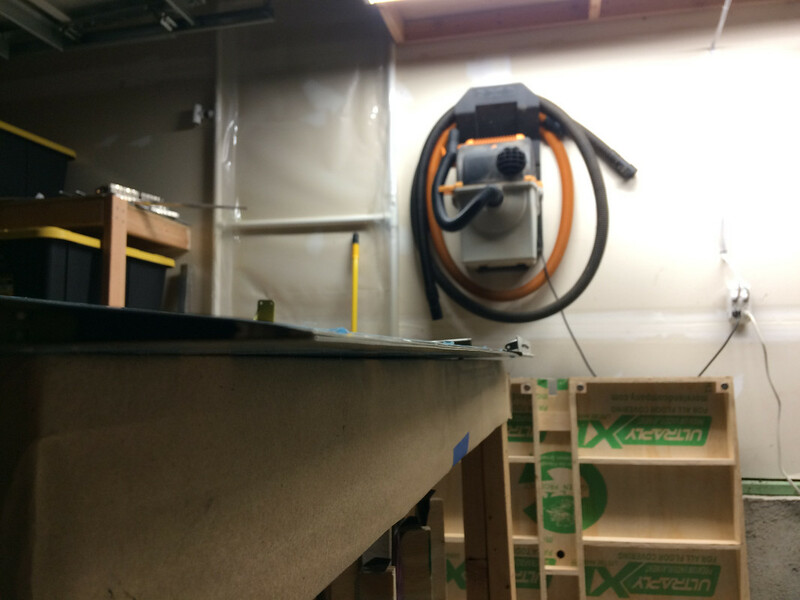 Before rudder assembly attach a 90 degree piece of aluminum angle to the side of a workbench (long enough to fit the entire trailing edge and use shims with a digital level to ensure it remains straight across the bench. 3. Complete all other steps up to the double sided tape on the trailing edge. 4. Tape the trailing edge together per the instructions and cleco the taped edge to the aluminum angle. Allow it to sit overnight. 5. Remove the cleco's and replace the aluminum angle with steel angle of appropriate thickness for back riveting. (shim the steel just like the aluminum to get a flat surface). 6. Use rubber clamps to secure the end of the trailing edge to the steel angle and back rivet the trailing edge IAW the instructions provided by Van's. Their were a lot of steps such as priming, riveting the skeleton and so on that I left out as I solely focused on the trailing edge here, but this worked out really well as you can see in the photo. The rudder trim tab that I fabricated got in the way of viewing the entire edge, but it has zero twist all the way to the end as far as I can see and measure. Hope this helps someone who may be approaching this step. Perfect timing as I'm working on the rudder as well. I like the idea of using a steel angle to back rivet, but how did the rivets come out? Some advocate alternating the shop heads as it makes for a symmetrical trailing edge. I came across one who suggested a flat set with a 8 deg angle to better form the shop head into the dimple (minimize the acorn look). My plan is to use the aluminum angle (match drilled to TE) to cleco the wedge and skins together while the adhesive (3M 5200) cures. Then back rivet on a steel angle. I ended up riveting all of them on the same side (no alternating) primarily due to the piano hinge I added on the trailing edge for electric yaw trim. It would have made it impossible to keep the entire edge clamped flat to the table during riveting with the hinge installed. I also determined that if you use the vans suggested method of only partially setting all the rivets first then it would be impossible to alternate sides and maintain a flat surface. The shop heads came out nice and flush with no smileys in the metal. I used the standard 1” flush set in the rivet gun with pressure turned down to about 80 psi. Simply followed as much of Vans suggestions as possible. Careful with the match drilling! I got the opportunity to build a second rudder when I did the match drilling as described above. Read the details here and go to the 21 April 2018 post. Don't do what I did and screw up each and every hole on the trailing edge causing me to scrap the rudder. I'm on the elevator now and as soon as that's completed I'll tackle the new rudder. Last edited by StressedOut : 09-13-2018 at 01:01 PM. I read your blog on the double holes in the trailing edge. I think the main reason is that you match drilled through aluminum into steel which likely took quite a while with the drill bit and caused it to wander slightly resulting in the elongated holes. Since I instead match drilled into aluminum (like we all do constantly on this aircraft), their was no elongation of the holes. Looks like your methodology was sound, just unfortunately bad results due to the material type. The one good thing is I have a rectangular steel tube pre-drilled with the correct spacing for the rudder TE. I expect the next rudder build will take about 10 hours less (50 instead of 60). Please take this advice as a suggestion rather then criticism. Yes your trailing edge is straight, not perfect but acceptable. Where I would make a change is that there are noticeable gaps between the skins, and the triangular metal wedge. Ideally the three parts, two skins and the wedge, should be firmly together at the trailing edge. Go to your local EAA chapter and find out if there are any Oskhosh winners in your area. Those are airplanes and builders to emulate. Keep up the good work, clearly you are motivated to have a nice airplane. For future TEs on the flaps, ailerons and elevators, perhaps this is something a light edge break can address. E.g., this is called out on Step 5 of page 22-07 for the ailerons. Also, in the spirit of learning like Tom offers, it appears that the skin on the top follows the trajectory of the wedge, then bends inwards towards the centerline. That can happen if the rivet set overlaps that edge at a shallow angle. I experienced this issue on my first rudder but with the benefit of 2,200 hours of experience, my second rudder came out much better.